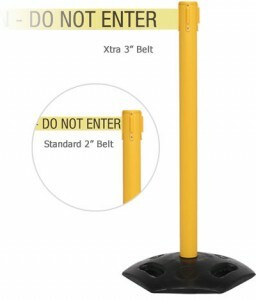 Boulevard Supply offers a variety of retractable stanchions for sale. 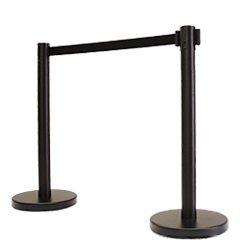 Retractable stanchions are crowd control devices commonly found in airports, hotel lobbies, restaurant buffets, movie theaters and banks. Also referred to as line barriers, stanchions allow you to contain and control the flow of your customers. Retractable stanchions can be reconfigured in seconds. 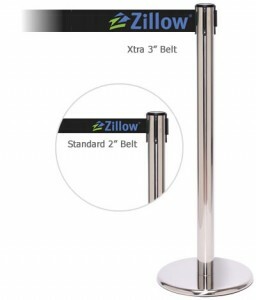 Looking for an attractive alternative to the standard black retractable stanchions? Take a look at our wooden retractable stanchions. Make sure to click on the wooden retractable stanchions tab. Queue Solutions has a wide variety of high quality retractable stanchions and stanchion accessories for retailers, airports, banks, stadiums, hotels, casinos, factories and construction sites. WARRANTY: Queue Solutions stanchions have a 3 year limited manufacturer’s warranty against defective material or workmanship. This limited warranty excludes damage due to accident, misuse, abuse or negligence. ASSEMBLY: No Tools Required. Hand screw post to base. 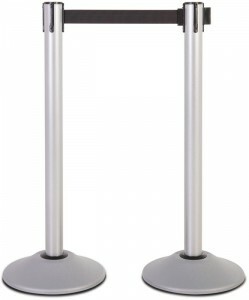 QueueMaster stanchions are Queue Solutions most affordable retractable stanchions. These are ideal for most indoor light use areas. BELTS: The 550 come with a 2″ Wide 8.5′ or 11′ belt. The Xtra has a 3″ wide 11′ belt. Belt cassette brake system included. USE: Recommended for indoor use. WARRANTY: QueueMaster 550 and 550 Xtra stanchions have a 3 year limited manufacturer’s warranty against defective material or workmanship. This limited warranty excludes damage due to accident, misuse, abuse or negligence. PRICE: Prices start at $44.95 each for black plus shipping for the 8.5 belts, $49.95 plus shipping for the 11′ belt stanchions. Price depends on choice of finish and belt length. QueuePro 201, 251 and 251 Xtra stanchions feature a heavy duty cast iron base making them an ideal choice for high traffic indoor locations such as airport terminals, car rental locations, retail stores snd sports and concert venues. BELTS: The 200 and 250 come with a 2″ Wide 11′ or 13′ belt. The Xtra has a 3″ wide 11′ belt. Belt cassette brake system included. WARRANTY: QueuePro 200, 250 and 250 Xtra stanchions have a 3 year limited manufacturer’s warranty against defective material or workmanship. This limited warranty excludes damage due to accident, misuse, abuse or negligence. PRICE: Prices start at $109.95 each plus shipping. Price depends on choice of finish, base style and belt length. The QueuePro 201, 251 and 251 Xtra stanchions feature a low profile cast iron base which is ideal for use in high traffic areas such as airports, retail stores, sports and concert venues. Low profile bases are less of a trip hazard. The QueuePro 201, 251 and 251 Extra also have the universal belt end which lets it connect to most other brands of popular stanchions. BELTS: The 201 and 251 come with a 2″ Wide 11′ or 13′ belt. The Xtra has a 3″ wide 11′ belt. Belt cassette brake system included. WARRANTY: QueuePro 201, 251 and 251 Xtra stanchions have a 3 year limited manufacturer’s warranty against defective material or workmanship. This limited warranty excludes damage due to accident, misuse, abuse or negligence. PRICE: Prices start at $129.95 each plus shipping. Price depends on choice of finish, base style and belt length. 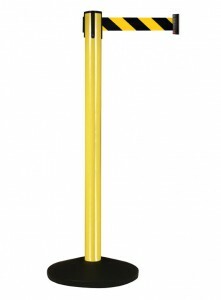 QueuePro 300 stanchions feature a beefy 3″ diameter post, a 16′ belt and weigh in at 24 lbs each. These retractable stanchion were designed for large set ups in high traffic venues such as concert halls, stadiums and sports arenas. BELTS: The 300 comes with a 3″ Wide 16′ belt. Belt cassette brake system included. WARRANTY: QueuePro 300 stanchions have a 3 year limited manufacturer’s warranty against defective material or workmanship. This limited warranty excludes damage due to accident, misuse, abuse or negligence. PRICE: Prices start at $139.95 each plus shipping. Price depends on choice of finish, base style and belt length. Queue Solutions RollerPro stanchions feature a discrete 4.5″ roller in the cast iron base. 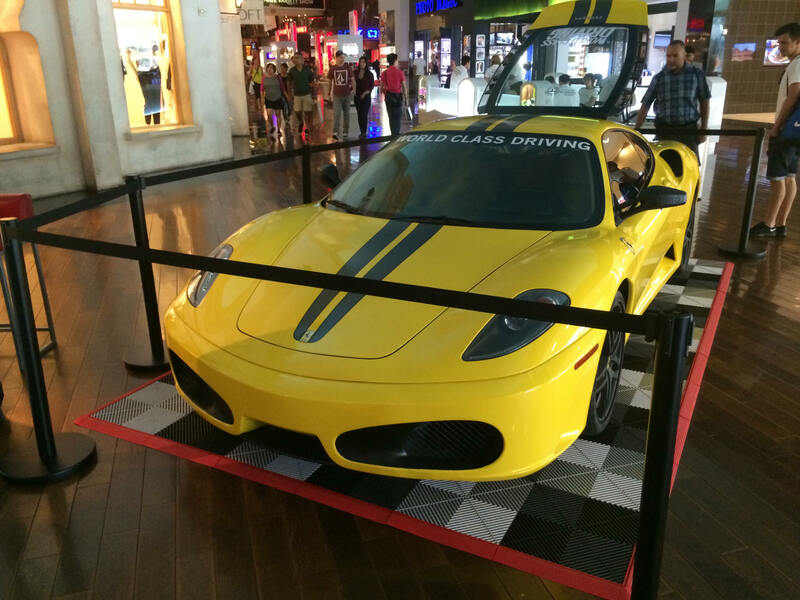 Simply tilt the stanchion back towards you and roll into position. These are ergonomically friendly and saves your employees from excess lifting. BELTS: The 200 and 250 come with a 2″ Wide 11′ belt. The Xtra has a 3″ wide 11′ belt. Belt cassette brake system included. WARRANTY: RollerPro 200, 250 and 300 stanchions have a 3 year limited manufacturer’s warranty against defective material or workmanship. This limited warranty excludes damage due to accident, misuse, abuse or negligence. Weather Master retractable stanchions by Queue Solutions feature a stainless steel powder coated post and recycled rubber base with molded in handles for easy transport. The Weather Master 250 stanchion comes with a 2″ Wide 11′ belt. Belt cassette brake system included. The 250 Xtra comes with a 3″ Wide 11′ belt. The 300 comes with a 2″ Wide 16′ belt. USE: Designed for outdoor use. WARRANTY: Weather Master stanchions have a 3 year limited manufacturer’s warranty against defective material or workmanship. This limited warranty excludes damage due to accident, misuse, abuse or negligence. Queue Solutions all weather outdoor retractable stanchions were designed for the most challenging environment you can use a stanchion in… the deck of a cruise ship! The cruise ship environment exposes stanchions and anything metal to salt water, salty air and chlorine from the pool. These three things can destroy a typical non-weatherized stanchion in a few months time. WeatherPro retractable stanchions are double powder coated and have an aluminum base, stainless steel post and stainless steel hardware. 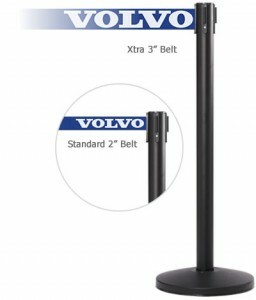 BELTS: WeatherPro stanchions come with a 2″ Wide 11′ belt. Belt cassette brake system included. 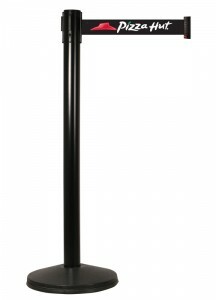 WARRANTY: WeatherPro stanchions have a 3 year limited manufacturer’s warranty against defective material or workmanship. This limited warranty excludes damage due to accident, misuse, abuse or negligence. PRICE: Prices start at $309.95 each plus shipping. Price depends on choice of finish, base style and belt length. Retracta-Belt Value series stanchions manufactured in the USA by Visiontron are very good quality stanchions available at a good price but options are limited. Retracta-Belt stanchions also have the belt cassette brake system which lets the belt slowly retract instead of whipping around which can be dangerous. Especially to children. USE: Recommended for indoor use or limited outdoor use. WARRANTY: Retracta-Belt Value series stanchions have a 5 year limited manufacturer’s warranty against defective material or workmanship. Depends on model. This limited warranty excludes damage due to accident, misuse, abuse or negligence. 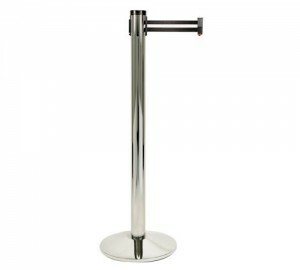 Retracta-Belt 300 series stanchions are very good quality stanchions with a large variety of options available. WARRANTY: Retracta-Belt 300 series stanchions have a 10 year limited manufacturer’s warranty against defective material or workmanship. Depends on model. This limited warranty excludes damage due to accident, misuse, abuse or negligence. 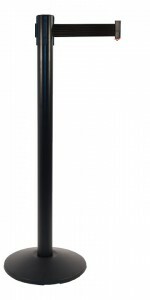 Retracta-Belt 320 series stanchions also offer a wide variety of options and feature a long 15′ retractable belt. USE: Recommended for indoor use or limited outdoor use. Can be weatherproofed for longer outdoor use. WARRANTY: Retracta-Belt 320 series stanchions have a 10 year limited manufacturer’s warranty against defective material or workmanship. Depends on model. This limited warranty excludes damage due to accident, misuse, abuse or negligence. Retracta-Belt Prime stanchions for indoor use are available in smooth black, polished stainless steel and satin stainless steel. They can also be plated Polished Brass, Satin Brass and Statuary Bronze. WARRANTY: 3 year limited manufacturer’s warranty against defective material or workmanship. This limited warranty excludes damage due to accident, misuse, abuse or negligence. PRICE: Starting at $49.95 each plus shipping for 10′ belt. LEAD TIME: Normally in stock in Las Vegas. 5 – 7 days to west coast locations. 3 – 7 days to east coast locations. USE: Weatherized and ready for outdoor use. PRICE: Starting at $65.95 each plus shipping for 10′ belt. Boulevard Supply is also a Tensator dealer. We have full access to Tensabarrier and Queueway retractable stanchions. Boulevard Supply is US Weight Steel Stanchion dealer. Primarily for indoor use, available in black or silver/gray, US Weight Steel stanchions are designed for quick assembly and dis-assembly. WARRANTY: 1 year limited manufacturer’s warranty against defective material or workmanship. This limited warranty excludes damage due to accident, misuse, abuse or negligence. 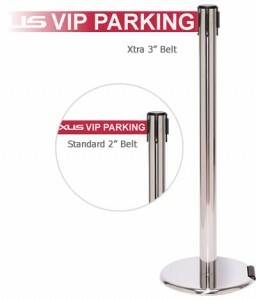 Retractable stanchions from VIP Crowd Control are good quality stanchions that come with either a 6.6′ belt or 10′ belt. Multiple finish options are available including wrapping of the stanchion post and base. Located in on the west coast in Southern California, VIP offers fast shipping and dependable service. PRICE: Starting at $44.95 each plus shipping for 6.5′ belt. $49.95 each plus shipping for 10′ belt. LEAD TIME: Normally, 24 – 72 hours on west coast. Four to six days for east coast locations. Polished brass, stainless chrome appearance, brushed stainless. PRICE: Starting at $54.95 each plus shipping for 6.5′ belt. $59.95 each plus shipping for 10′ belt. Affordable high performance retractable stanchions with 10′ belts and two year warranty from QueueWay. These adapt to most other brands. WARRANTY: 2 year limited manufacturer’s warranty against defective material or workmanship. This limited warranty excludes damage due to accident, misuse, abuse or negligence. From standard black post and black belt to polished stainless steel and brass, we have retractable stanchions that will meet your criteria and budget. 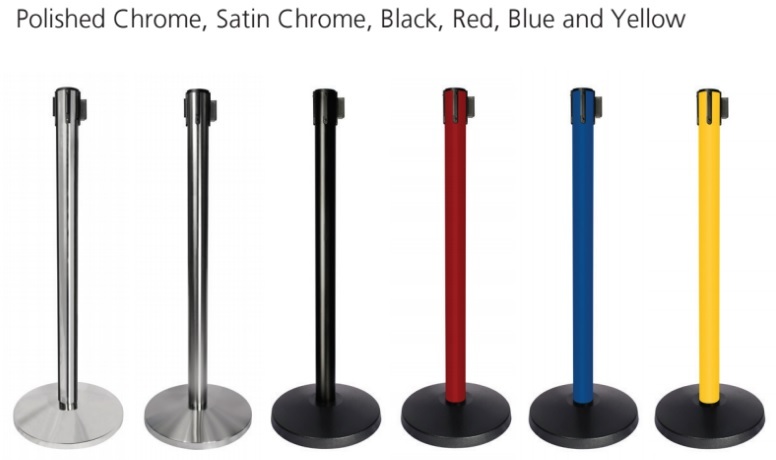 For an additional fee, we can have your stanchion order powder coated or wrapped to meet your color requirements. The retractable belts are also available in a variety of colors. Due to the wide variety of options and choices, we recommend you contact us with all the specific details required for your order including shipping destination zip code as shipping charges vary across the country. We highly recommend you make a map of your floor plan. Use dots for stanchion posts, uses lines for the belts. Remember to leave gaps for entrances and exits. It is also recommended to leave 36″ between the bases in the aisles for wheel chair access. Also, if your stanchions come with a 10′ retractable belt, we recommend you only extend the belt 9′ to 9.5′ so you have some slack left in the belt cassette. QUANTITY: How many stanchions will you need? Did you make a floor schematic? 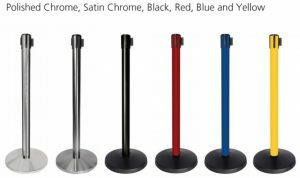 POST AND BASE COLOR CHOICE: So many options here… Black, polished stainless steel, brushed stainless steel, polished brass, many powder coated colors, clear/see though stanchions and stanchion wraps are available. BELT LENGTH & BELT COLOR CHOICE: Most manufacturers offer two to three belt lengths with their stanchions. Ordering a longer belt offers you more flexibility and may require less stanchions for your project. Longer belts cost a bit more but may save you money in the long run. There are many belt colors choices available and what you see on a computer monitor may not exactly reflect the actual belt color. Provide us with a starting point and we will find your ideal color. Belts are also available pre-printed with standard messages such as “DANGER”, “KEEP OUT”, “CAUTION”, etc… Custom screen printed logo and wording is also available. STANCHION USE: There are a couple factors here. Will your stanchions be used indoors, outdoor full time or outdoors on occasion? Depending on location and the amount of time your line barriers will be used outdoors, they may require weatherizing or weather proofing. Also, do you know if you city or county code requires that your stanchions be ADA compliant? DESTINATION: Are we delivering to a business or residence? Do you have a fork lift or loading dock available? Will you need lift gate service? Any special instructions?